6 month update – parking, roofing, and rot, oh my! We are now officially into the 6th month of the project. After our village issued the work permit on August 17th, 2017, we applied for a parking permit on September 15th, 2017 when it appeared work was imminent. Our house is walking distance to two schools, and there are street parking restrictions as a result. Our driveway is long and narrow, and only wide enough to accommodate a single car. Since the contractors can’t park on the street, the driveway is their only option. The parking permit allows us to park our car on the street when contractors are using our driveway. That permit was good for six months, and the police officer we received it from told us to return to have it renewed. When we returned last week, the police department denied the renewal. Maybe it was just a bad day, or maybe a neighbor has been complaining. Who knows. The police suggested we escalate it to the community development department. So, I wrote the department a letter explaining the situation, and they are meeting with the police department on Friday to see if they can sort this thing out. I remain hopeful. There are a number of updates to report over the past week. Now that the structure of the addition is mostly in place, I feel like the updates will be less and less dramatic. Parking – Parking permit pending. I never thought I would be writing about parking problems. Of all the problems I knew we would encounter on this project, this was not even remotely on my radar. I just assumed it was a package deal with the cost of the work permit and the value we are adding to the village! The lesson is to expect the unexpected – and, formulate contingency plans. Roofing – Since it’s clear we have roof and gutter problems with the existing house, we want to make sure we have a solid roof and gutter system in place before work begins on the inside of the existing house. I’ve been working to get quotes on roofing and gutters, which has been a challenge because the gutters are concealed, internal gutters. Unlike the typical aluminum gutters that hang on the outside of the roof fascia, these gutters are built into notches in the actual roof rafters. That means that each section of the gutter must be custom fabricated on-site, and to achieve the pitch necessary to actually drain water into the downspouts, the pitch must be fabricated into the gutter. Since our gutters are old and have been poorly maintained, and with the settlement of the house, there are many leaks. On a house with modern gutters, a leaky gutter is a minor inconvenience. On ours, it means the leak is coming into the eave itself, which can cause rot. To make matters worse, some previous owner of our house decided not to address this problem, and simply masked it by covering the gutter boxes with aluminum cladding. The original wood fascia trim is underneath, rotting away. In some places, the gutters are sagging and about to fall off. The roof and gutters of the addition ties into the existing roof near our existing kitchen. 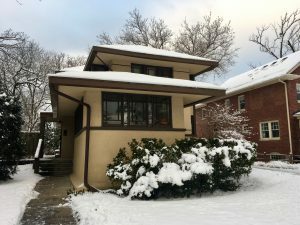 We would like those to match seamlessly, so the ideal situation would be to tear off the old roof and put on a new one across both the addition and old house so that we have seamless gutters and shingles. Our contractor is being very flexible with us. While roofing and custom gutters was part of the quote for the work, they will let us bring in our own contractor to do both the addition roof and old roof simultaneously. The trouble, though, is finding a company that can do the carpentry (which is extensive), fabricate custom copper gutters, and do the roofing. Rot – The rot is not just contained to the eaves. I have noticed several of the existing windows that have rot as well as window sills. Since the windows are historic, we want to preserve them, and so have been looking for quotes for window restoration from a historic window restoration contractor. Electricity – Our electrician and village power company switched our power over to the new transformer on Monday, and removed the overhead power line from our house. 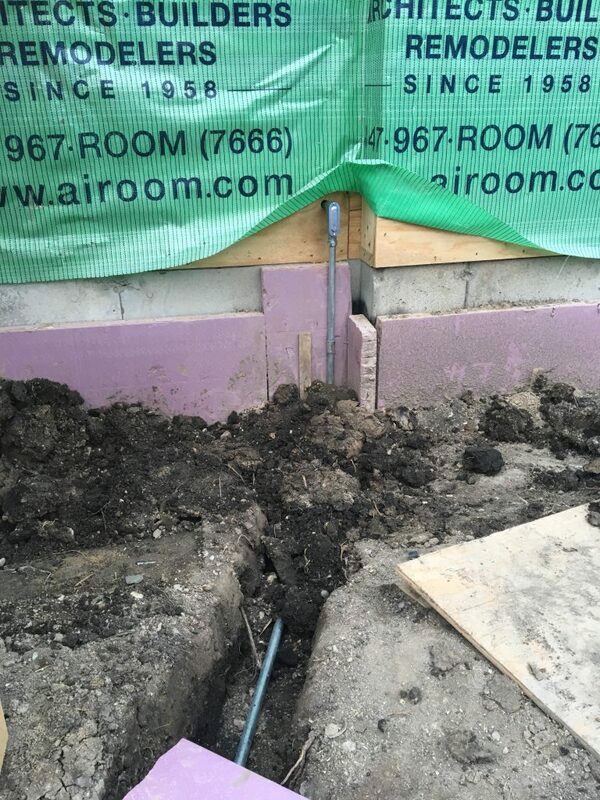 The electrician has also started re-installing buried electrical lines to our garage (which has been power-less for months) and our lift station (sewer), which has been served by a heavy-duty extension cord for months. Concrete – The concrete slab pour has been “pending” for months. With improvements in the weather, our concrete contractor finally arrived today to finish up the work on the basement. That will allow carpentry to proceed in the basement, and we can get plumbing and electrical in shortly afterwards. Water Service – The water service upgrade, previously scheduled for last year, has been rescheduled for next week. I met with the plumber this week to confirm that the water line will be at least 10′ from the sewer line and show them the location where we want it installed. Window Order – Our contractor confirmed a number of details in the window order for us, including the grille pattern changes. The door into the addition will need to be slightly shorter than usual. A standard door is 80″, but because of the low eaves, we are looking at 77″ instead. Our contractor has also decided that it would be easier to order us another new window than it is to move the existing window that they are removing from our dining room. 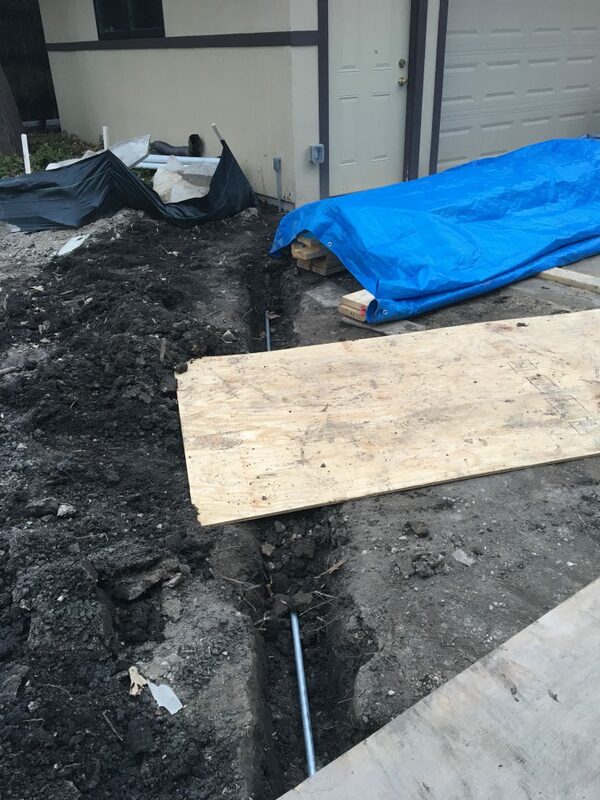 New buried electrical connection from the house to the garage. I’ve asked for a switch to be installed in the addition so that we can turn our garage lights on and off from inside the house.